Boaters enjoy being out on the water as much as they can. It can be very relaxing and peaceful, or exhilarating and exciting. Truth be told, no one wants to have to be worried about the safety of his or her belongings on a boat. Therefore, we have designed the RokPak so you can have the peace of mind you deserve whilst out on your boat. Built in LCD display which enables the user to be aware of the amount of battery power left without being a distraction from your boating excursion. The Built in LCD display also has the function of informing the user of the ports which are currently in use. The RokPak is designed to protect the user’s devices against external shocks such as those which may be incurred from physical movement which encounter hard pressures like rough waves encountered by boaters out on the water. The water activated LED SOS feature is also complimented by the fact that the RokPAk is water proof as such the user need not be concerned about its durability or functionality whilst on the boat. There is a built in solar panel which facilitates efficient use of power to recharge to the RokPak even whilst you lounge or relax on the boat. This solar panel also has the benefit of being shatterproof. Designed to be charged with a micro USB charger or car charger, so this can be done before going out to sea. There is also a 4 function LED flashlight which features a low and high intensity display, one that pulsates as well as the SOS feature. All these make RokPak the ultimate boaters companion! RokPak is designed to safely house your smartphone and other electronic devices (protecting them from water damage if you encounter water sprays whilst on the boat or go for a swim), keys, wallet, drivers’ license and other personal items. Not only does RokPak keep them dry and ensure their safety it also acts a protection from sand particles that are almost impossible to escape when docked ashore, especially in speaker openings as well as charging ports on smartphones and other electronic devices. This is critical as it is well known that sand particles can damage the sensitive internal electronic parts of devices. The RokPak is able to provide charge for boaters video cameras, GoPros or camera to ensure that your ability to capture beautiful footage with no concerns for damage to it whilst you are on the boat is not compromised. The RokPak is head and shoulders above the competition as it also features a built in solar panel which harnesses the sun’s energy to ensure whilst you enjoy your time on the boat, it is charging. Understandably a concern you may have is how will you find the RokPak if it falls into the water. Therefore, the RokPak is designed with an LED SOS beacon which can be easily seen and is automatically activated once it hits the water. This is also something that can help if you go overboard as well. Having a RokPak with you in an emergency situation is a smart choice for boaters. The RokPak is specifically designed to withstand both internal and external pressures. Therefore several heavy electronic items can be stored by a user without damaging the interior. In addition, should fellow boaters step on it or should you fall, you need not worry that the contents inside will be damaged or that the exterior will be damaged. So what are you waiting for? Get your own RokPak for use with as many outdoor activities as you please! Boaters will truly appreciate a device like this! Love to give a try. What’s the water depth rating. Rokpak would be a great gift for any boater! Maybe I’ll get one for my brother -in-law to use on the lake for his boat. As long as there is sunlight, you have some power being created. A renewal of power that you can depend on! Can’t wait to use my win…see what I did there? this is a really neat item to keep certain important electronics dry!! One heck of a handy item when you can’t get to a wall plug at home to recharge your toys. RokPak, your go anywhere power solution. Does anyone know if the Nintendo Switch will fit it the RokPak so I can take it on the boat? The RokPak is a really great idea for boating. MY BROTHER LOVES HIS WHEN HE GOES OUT ON THE BOAT! ITS GREAT HES A FISHERMEN AND GOES OUT FOR LONG PERIODS OF TIME. OK – you have a boat, and off you go. Miles from nowhere you find yourself with an emergency. I hope you have a good battery pack for your electronice. RokPak to the rescue – bew sure you have one of these waterproof battery packs with you whenever you “leave the beaten path”, as it just might save your life. 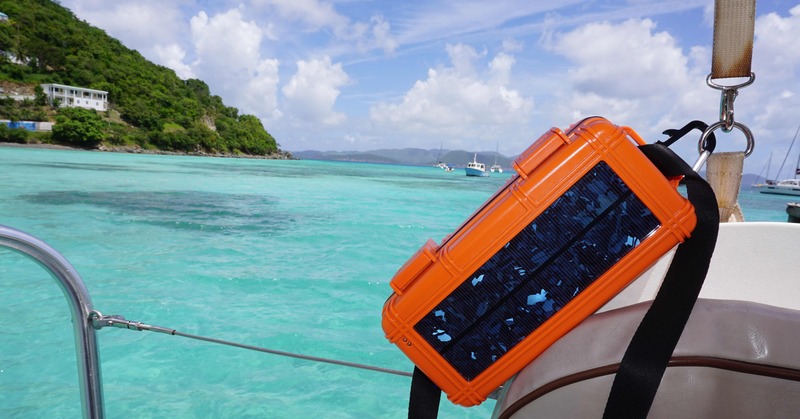 Waterproof Battery Backup and solar power… good the have I.C.E.